In this post, I’d like to show you how to convert VOB files to play on iPad. First, let’s know something about VOB. VOB stands for DVD Video Object. It is basically one of the core files found on DVD-Video discs and contains the actual movie data. Basically VOB file is just a basic MPEG-2 system stream — meaning that it is a file that contains multiplexed MPEG-2 video stream, audio streams (normally AC3 and DTS formats) and subtitle streams. Click the “Add Video” button to import the VOB file from your computer. Alternatively, you can click “File -> Add Video Files…” to add the VOB file. You can also batch import VOB files by clicking “File -> Batch Add Video Files”. 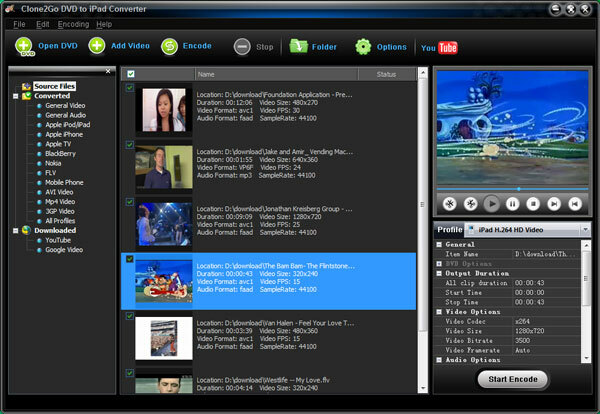 More simply, you can directly drag and drop VOB files onto the main panel of Video Converter App from your computer hard drive. From the “Profile” drop-down list, choose the “Apple iPod/iPad” category. 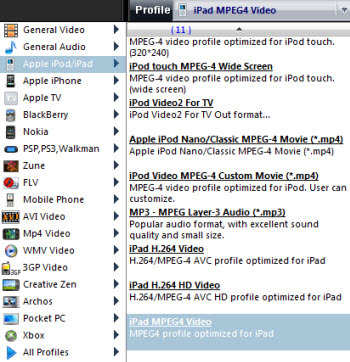 Then you can choose iPad H.264 Video, iPad H.264 HD Video, or iPad MPEG4 Video as the output format. Click the “Start Encode” button to start to convert VOB to iPad. After the conversion, you can click the “Folder” button to locate the converted video files in your computer. Then you can copy them to your iPad.